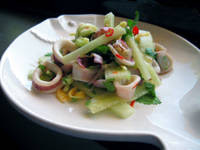 A spicy, bright Vietnamese calamari salad that just may be the perfect summer appetizer: Done right, the squid is almost buttery, the ginger snappy, the chiles warm and the cucumbers cool. The dressing -- based off a dipping sauce developed by Sacramento, CA, chef Mai Pham -- is garlicky and sweet, and cilantro adds an herbal touch. You can substitute in mint or basil (especially Asian basil) if you don't like cilantro. This recipe serves 4 as an appetizer. Rinse the squid well under cold water; make sure the insides of the tubes are clean. You can peel the skin off the squid, but I don't -- I like the way it looks. Slice the tubes into thick rings and set aside. Bring a pot of salty water (it should taste like the sea) to a boil. Slice the ginger into very thin strips, as thin as you can make them. Slice the chiles into very thin rings, or if you are using a habanero, tiny chunks. A whole habanero will make this dish very hot, so I'd use just half if you are going this route. Remove the seeds from the cucumber and cut it into thin slices, or chop it into small dice. Either way is fine. To make the dressing, mash the garlic cloves and the 2 other chiles (or other half of the habanero) in a mortar and pestle. If you don't have one, chop everything up very finely and mash it with the flat side of your kitchen knife. Add the sugar and grind it into the chile-garlic mixture, or mix it with the chile-lime paste in a small bowl. Then add the fish sauce, water and lime juice and stir well to combine. To cook the squid, toss it into the boiling water and let it cook for no more than 30 seconds. I cook my calamari for only 15 seconds. Really. It really only takes that long to get buttery squid. Finish the salad by tossing all the ingredients together in a bowl and serving. You can chill the salad in the fridge for up to a day before serving, and it tastes equally well cold or at room temperature. To drink, I'd propose an off-dry Gewurztraminer or a California Roussane if you're a wine drinker. But I prefer a frosty pilsner or lager beer with this dish.